Daily Illuminator: The Real Me? June 19, 2013: The Real Me? So . . . 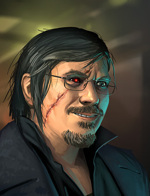 I mentioned that I was a backer of Shadowrun Returns. At an enthusiastically high level. Anyway, it turns out that one of the goodies is an NPC modeled after me. I just got the art. I like it. It was created by David Nash. He worked from a photo, and he managed to keep it recognizably me while adding a huge dose of CREEPY. I will be using this for convention-program photos for a while . . .